I've been working with QR codes since the tail end of last year and have seen an impressive growth in interest from marketers and consumers, with QR codes appearing in all sorts of different places, from the Metro newspaper to estate agents' windows. Doing social media work with the Tag Street twitter account @tag_st, I get to keep an eye on how these codes are being adopted around the world. Whenever you're working for any length of time with a technology that's new to you, it's quite common to try and think up other uses for it, testing things out in new ways to see if they'll work. So, a month or so back, I had the idea of creating a QR code trail using little stickers that could lead people from one point to the next. I asked on Twitter to see if any of my followers would scan a random QR code they found on the street. Some seemed curious, others unsure, or even concerned, and others definitely wouldn't. A good cross-section, I thought, and enough to convince me to get some stickers printed up (Moo stickers were perfect for this) and give it a shot. On 1st June I tweeted the start point of the trail, on the northern part of Tower Bridge and it was soon picked up and retweeted by the London SE1 hyperlocal site. The same day, the first tag got scanned by a couple of people, but nobody made it to the second tag, or any further than that. Nobody has scanned any of the tags since, despite all (but one, the final tag) still being in place*. These tags had their own unique website address printed on them (at QRtrail.co.uk/something) but that was about it. They didn't provide a clear way that a person could benefit from scanning the code. 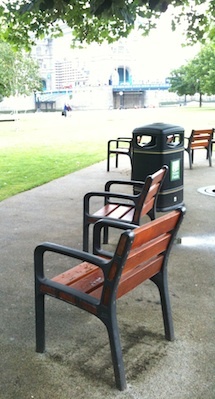 In fact, the last tag - the treasure if you will - was simply a nice relaxing place to sit, with a nice view of City Hall, Tower Bridge, and Potters Fields park. If I'm going to try this again, it'll need some rethinking, probably some better publicity, and a prize at the end to encourage people to try it out. Meanwhile, if you'd like to try out a sheet of 6 stickers wherever you are, let me know and I'll sort you out with a set of tags that you can edit at qrtrail.co.uk. 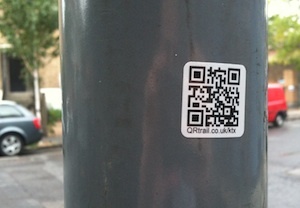 If you'd like to try the SE1 trail, visit QRtrail.co.uk/trail/se1 and let me know how you get on. What about a free map for people who found the treasure? I would scan a QR code if I'm not in a hurry. That's right Dan! I am also now using qr codes for my mobile marketing campaign. QR codes are now gaining popularity on the internet marketing industry due to its benefits and advantages of connecting with clients as well as consumers.